RI Tuna and Shark Fishing Charters on the Adventure Fishing Boat. Let us take you on a light tackle fishing charter for Tuna or Sharks on our 33' Adventure. 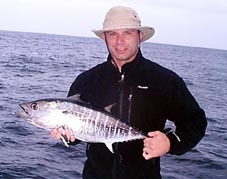 Tuna and shark fishing trips can be very exciting and will test tackle to its utmost, especially light tackle. From mid-summer to fall, tuna can be found in the waters of Block Island Sound and Rhode Island sound. In the early part of the season we troll daisy chains, squid bars, and cedar plugs for these fish in offshore waters. As the tunas settle in, we will chunk for them with bait. If they appear on the inshore grounds, they typically won’t take the trolled lures in the shallower water; it's necessary to get close enough to cast small topwater plugs or metal lures. Either way, nothing can compare to the speed at which any species of tuna can peel line off your reel. They are the fastest gamefish in Rhode Island waters and are so much fun to fight. If we see tunas on the inshore grounds during a Striper Charter, we will go after them if our clients have the skill at casting with spinning gear. If we expect them around the inshore grounds, a trip on our smaller boat can be switched to target these fish instead of whatever trip was planned. 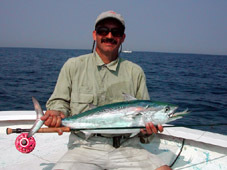 We had good numbers of false albacore, and bonito in the waters west of Point Judith in 2009, and bonito out at Block Island right through October. The enormous schools of bait kept them there for a few weeks in late August, and the fishing was both spectacular and frustrating. Some days we could pull in 6 or 10 fish, and other days they were so skittish you could only hook a few. Of course, as more boats show up to chase them, it makes the fish more skittish, especially since many anglers don’t understand how to approach breaking tunas. Bringing up the boat, stopping and casting to breaking fish, have a hook up and the reel starts screaming... I just love this stuff, can't get enough, it's addicting. Our preferred way to catch tuna is chasing them with light tackle on our Aces Wild 2 25' center wheelhouse boat. It is definitely exciting. Shark fishing usually begins sometime in August when the waters have warmed enough for numbers of them to appear. We drift and chum for sharks and use what for us is heavier tackle (50lb class rods and reels). It can be very exciting when you hook a big Mako and the shark jumps out of the water several times during the fight. Or you catch a mean old blue shark who has no intention of ever letting you get him to the boat. The real excitement is when you get a keeper shark up to the boat and he needs to be tail wrapped-- that can be very interesting but still fun. Regulations allow us to keep one of any species of shark per trip. We will fillet and clean any edible sharks or tunas before you leave the dock. Regulations allow us to keep one school and two medium size bluefin Tunas per trip. There is no limit on bonita or false albacore, but the albies are mainly a gamefish and only good if you use a smoker to cook them. See the Latest Fish Pictures. 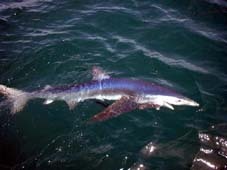 Book a Rhode Island Tuna or Shark Trip today. Nice Light Tackle Bluefin tuna. Mako shark jumped out of water. 10lb Fly Rod Albie Tuna. 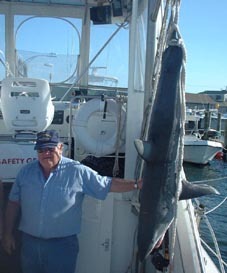 Angry 150lb Blue Shark on the line.